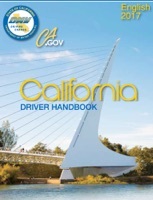 This California Driver handbook includes interactive features, complete with quizzes and videos, which bring the driving learning experience to a whole new level. This is an innovative and fun way of learning how to become a safer driver on our roadways and highways. It offers a comprehensive overview of the rules of the road and includes the following topics: how to acquire a new license or renew an existing license, a summary of standard road signs, safe driving tips, and how to properly share the road with other vehicles, mass transit, pedestrians, and cyclists.